Despite the virtual disappearance of the steam locomotive from most major railway systems in the world, interest has not only remained high but has been growing at a remarkable rate, especially in the area of miniature passenger hauling locomotives. It is no exaggeration to say that hundreds of locomotives in, particularly in 31/2", 5" and 71/4" gauge are under construction by amateurs in any year; some are completed in a matter of months, but others may occupy a builder with limited spare time for ten years or more. 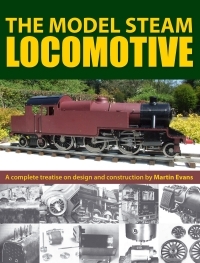 Contributing to the numbers of models built and the widening knowledge of the subject is the work of Martin Evans, for many years Technical Editor and subsequently Editor of Model Engineer, and undoubtedly today’s most prolific writer on, and designer of, locomotives for amateur construction. His earlier book, Manual of Model Steam Locomotive Construction, became the standard work on the subject; The Model Steam Locomotive is to some degree an extended and updated version which can confidently be expected to become the standard reference in future.